Sharp’s PN-K321 4K Ultra HD LED monitor, which displays images at a resolution of 3840 by 2160 pixels, is on sale for $5444 through Apple’s U.K. and other European online stores. The monitor is not yet listed on Apple’s U.S. online store. Some TVs and monitors already support 4K, the successor to current high-definition specifications in which images are displayed at a 1920 by 1080 pixel resolution. This Sharp monitor shows “four full HD screens on a single seamless display,” according to the product description on the website. Apple until now has not directly sold a 4K display, but could ultimately add 4K capabilities to its Thunderbolt Display monitor, which displays images at a resolution of 2560 by 1440 pixels. The Sharp display has DisplayPort and HDMI connectors. The Thunderbolt 2 ports in Mac Pro support DisplayPort. 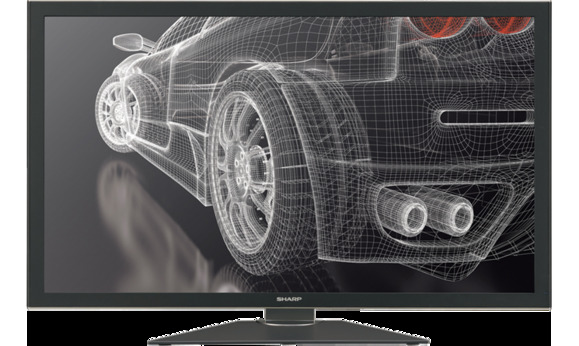 The monitor is based on Sharp’s IGZO (indium gallium zinc oxide) semiconductor technology, which allows smaller pixels to be crammed into the same space so screens can display higher-definition images. The IGZO technology “supports increased pixel transparency and reduced current leakage, thereby making the monitor more energy efficient,” according to the product description.